One of Portland’s top industries is travel. It’s no wonder – our food, lifestyle, transportation system and sights are frequently covered in The New York Times, Travel Channel, FoodTV and other national media outlets. From late May through September, Portland sees a surge of visitors from around the world. Living in Portland, it’s easy to overlook some of the amazing things that the city has to offer. With busy lives, it’s hard to carve out time to get away, so we decided to do a mini staycation – one evening after work through mid-morning the next day – something most people could do time-wise and within a modest budget. The cornerstone to our mini staycation was the Garden Spa room at the Hotel Vintage Plaza [422 Southwest Broadway, (503) 228-1212]. Situated right in the heart of downtown, this hotel was a perfect base camp for our quick break. We signed up for the ‘romance package’, which was just a little more expensive than the standard rate but well worth it. Mid-week room availability was really good and so were the rates. The Garden Spa room at the Hotel Vintage Plaza was perfect – quiet, clean with every detail taken care of. 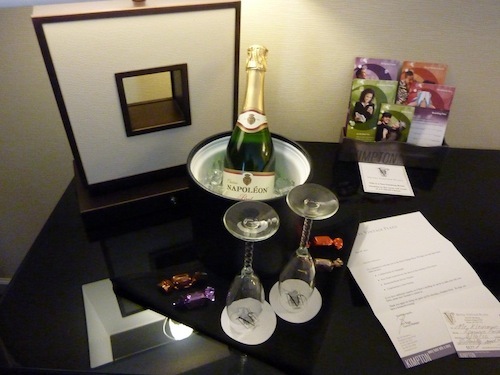 As part of the romance package, the bed was sprinkled with rose petals, we had a complimentary bottle of champagne, and a $30 credit to Pazzo Ristorante or for room service. The real star of the Garden Spa Room is an outdoor hot tub. 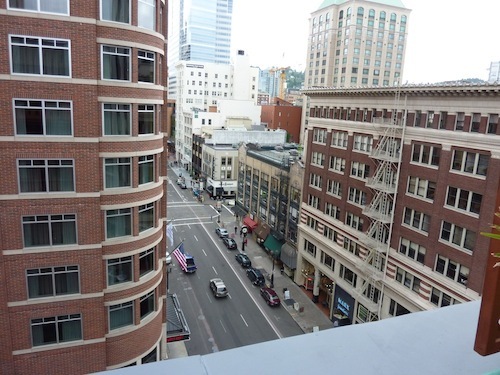 While the Hotel Vintage Plaza is surrounded by tall buildings (which means the office across the way and hotel next door have views of the tub), it does have a fantastic view. 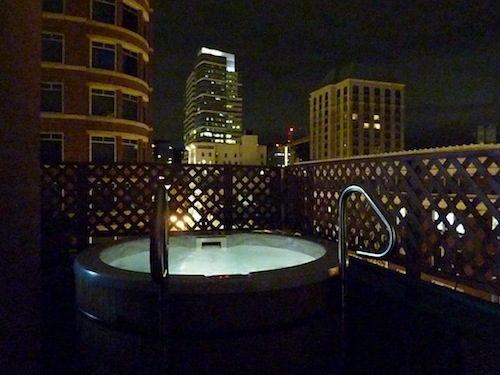 Sitting in the hot tub looking out over the city was a fantastic experience. You literally get a fresh view of the city. 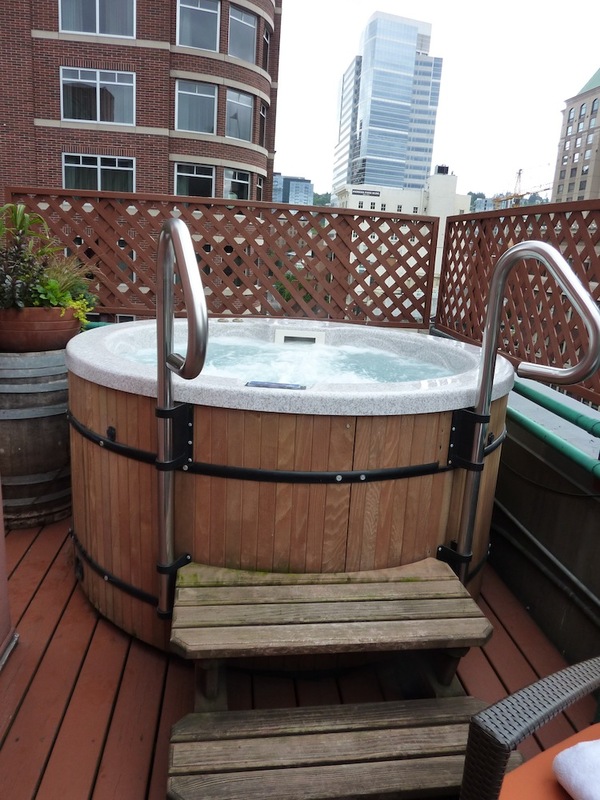 The hot tub was extremely well maintained, clean and already set to a good temperature (there’s nothing like having to wait for a hot tub to heat up to ruin a romantic evening). The hotel provides nice thick bathrobes so you can sit on the veranda and enjoy the city in between dips in the hot tub. 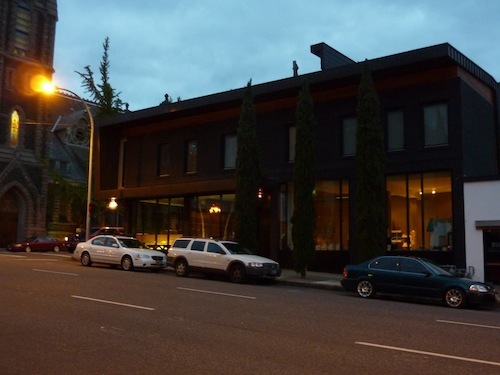 Once we were ready to get our evening underway (and it was hard to leave the absolute comfort of the Garden Spa Room) , we took an eight or nine block stroll to Bluehour [250 Northwest 13th Avenue, (503) 226-3394]. While the restaurant is very well known in Portland for its food, many people are unaware that the bar serves some of the best cocktails in town. Bar Manager Tommy “Tweed” Klus has assembled a fantastic team of bartenders (including Alan Akwai) and an ever-changing list of cocktails, both classic and new. 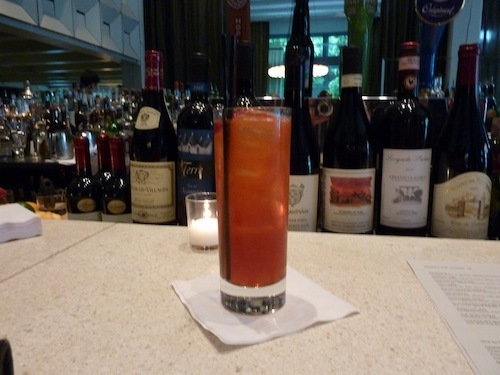 We had Tommy’s Juan Collins ($10), a fantastic mix of tequila, lime, strawberry, mezcal and mexican coca cola. It’s the kind of cocktail you can sip on a warm evening and a perfect cocktail to whet your appetite before dinner. 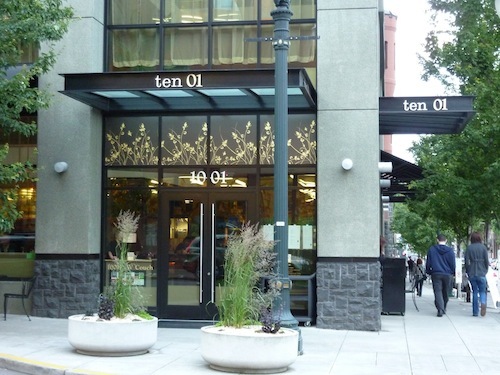 From Bluehour we moved on to Ten01 [1001 Northwest Couch Street, (503) 226-3463]. Ten01 may have had one of the roughest openings of any Portland restaurant, but several years later (and several chefs later), it’s found its stride and is one of the better restaurants in the area. 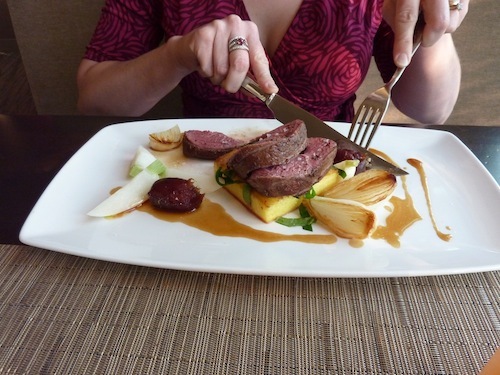 Chef Michael Hanaghan is doing fantastic Northwest cuisine with local ingredients. The absolute highlight at Ten01 was the Cattail Creek leg of lamb with crispy polenta, medjool dates, glazed turnips, spring onions and sorrel corriander jus ($29). From Ten01 we walked across the street to Powell’s Books (1005 W Burnside). 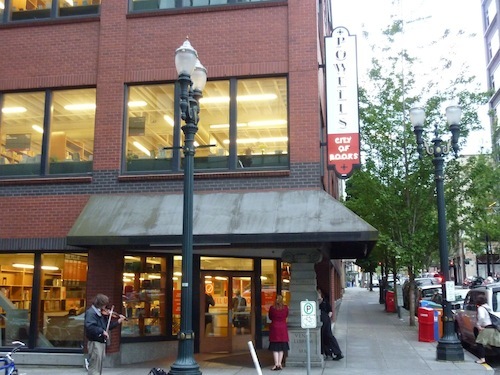 Portlanders tend to be pretty cavalier about Powells, but an ENTIRE city block worth of books is something to be appreciated. If you ever want to truly appreciate Powell’s, stop at a Borders or Barnes and Noble and check out their cook book selection and then go to Powell’s and compare. The difference is literally five times the books, and this holds true for most sections. The Pearl gets a pretty bad rap, but it’s really undeserved. An after dinner stroll through The Pearl is extraordinary and mid-week you’ve got most of it to yourself. 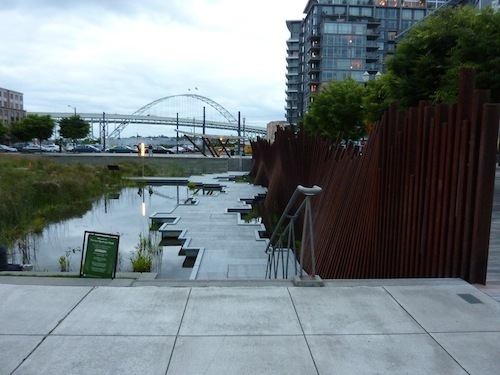 We walked from Powell’s through The Pearl, past Jamison Square Park to Tanner Springs Park (NW 10th Ave & Marshall St). Tanner Springs is a unique urban park that fuses industrial with wild wetland. It’s a perfect spot to sit and watch the sun set over the Fremont bridge in the background. Since we already had a bottle of champagne back at the room, we only browsed at Pearl Specialty Market and Spirits [900 Northwest Lovejoy Street, (503) 477-8604], which has the best selection of spirits in Portland. From there we walked a few blocks and caught the Portland Streetcar. 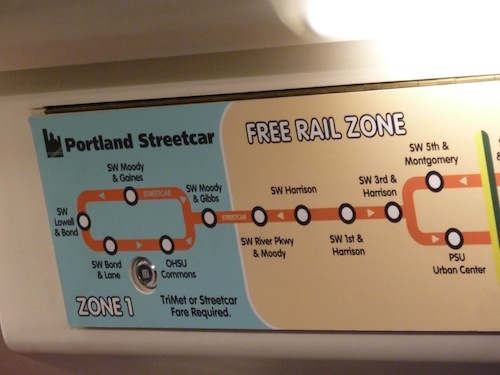 Like MAX, the Portland Streetcar has a free zone through the heart of the city. We decided to check out Gruner [527 SW 12th Avenue, (503) 241-7163], which is steps away from the Portland Streetcar stop. 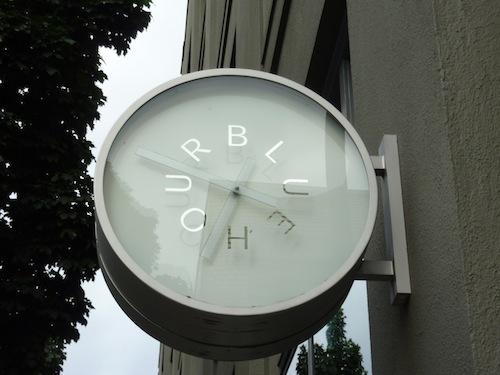 Gruner is part of Portland’s “Golden Triangle of Cocktails” which also includes Bluehour, Clyde Common and Teardrop Lounge. You can easily barhop between these bars by foot and they represent the best cocktails in Portland. We finally landed at Teardrop Lounge [1015 Northwest Everett Street, (503) 445-8109], the epicenter for cocktails in Portland. 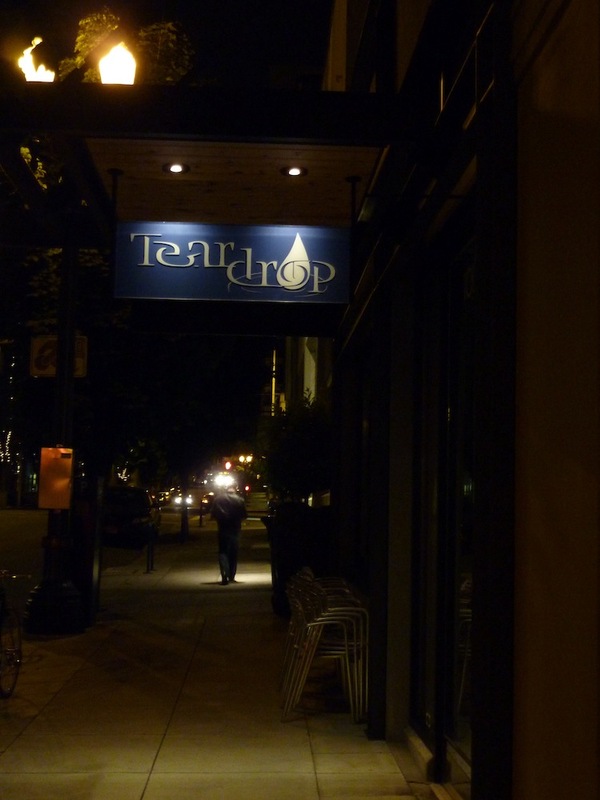 All the top Portland mixologists either work or have at some time spent time behind the bar at Teardrop. Currently, nationally renowned mixologists Ricky Gomez works behind the bar. Teardrop currently has a menu of over 30 drinks, combining classic cocktails, creations from their house mixologists, and cocktails from notable bartenders across the country. Two of our favorite come from Erik Atkins out of San Francisco, including the Rhum Agricole Punch and Carter Beats The Devil (not pictured here but both amazing). 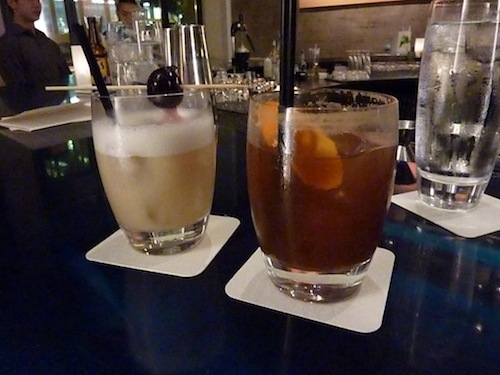 Drinks at Teardrop run $8-$14 but they are some of the very best you’ll find. The end of our evening found us back at the hotel enjoying the hot tub overlooking the empty streets of Portland at night. The next morning we decided to use our $30 meal certificate at Pazzo which is connected to the Hotel Vintage Plaza. 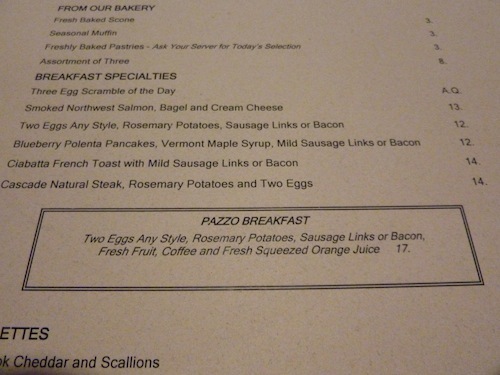 Pazzo for breakfast feels a lot like a hotel restaurant with prices to match. The breakfast special was a whopping $17, almost the price for two people to eat at most of Portland’s great breakfast joints. With a time short before we had to get back, we decided to walk across the street to Public Domain Coffee [603 SW Broadway, (503) 243-6374]. Our favorite (and arguably the best coffee in Portland) is Barista [539 Northwest 13th Avenue, (503) 274-12110] but Public Domain does a very good job with their coffee with skilled and knowledgable baristas (and it was right across the street). 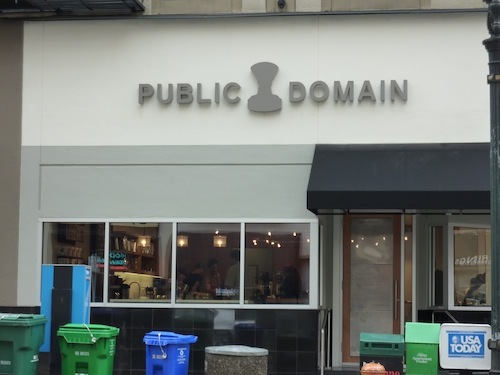 Public Domain is also a great urban cafe, the perfect place to sip a cup of espresso in the city and go on about your day. Our Portland mini staycation didn’t include sights in Portland like the Chinese Gardens, Portland Tram or Rose Garden, as we’ve been to many of those MANY times with out of town friends and relatives, but we did get a nice slice of Portland and enjoyed it in a way we don’t normally. Taking a break in the city you live in, when that city is Portland, is an exceptional experience, even with extremely limited time. A Portland staycation quickly shows you why so many people travel here to enjoy our fantastic city.